Before your employees attend annual refresher safety training, consider adding additional topics like Ladder Safety and Slips, Trips & Falls. Liberty Mutual released its 2018 Workplace Safety Index to reveal the Top 10 causes of serious, non-fatal injuries. These injuries cost the company money in terms of insurance expenses, days lost and decreased productivity. Overexertion. These types of injuries are related to lifting, pushing, pulling, holding or carrying objects. 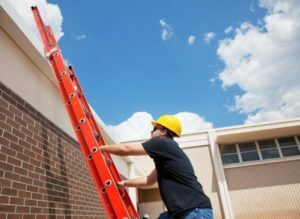 Employees should be trained on proper lifting techniques and back safety. TIP: Minimize distances loads must be carried. Same Level Falls. An example of this injury is tripping on an extension cord on ground level and falling. This does not include falling from an elevated walk way or from a ladder onto the ground level. This type of injury costs businesses an estimated $11.2 billion in direct costs. Employees should be trained on slips, trip and falls. Ways to help eliminate hazards include good housekeeping, quality walking surfaces, proper footwear, and walking at an appropriate pace. Falls to Lower Levels. Examples of these injuries include falls from ladders, scaffolds, tops of equipment and other elevated work areas. Ladder falls account for the majority of these types of injuries. Make sure employees receive Ladder Safety training. TIP: Use the hierarchy of hazard controls to prevent these injuries. Struck by Object. Falling tools while performing equipment maintenance is a major cause of these types of injuries. TIP: Properly stack materials, always wear proper PPE, and don’t work under heavy machinery when in operation. Other Exertions. Examples of these injuries include working in unnatural positions or exerting too much physical effort. Make sure employees are trained on proper ergonomics that prevent getting in awkward positions. Motor Vehicle Accidents. The average car crash costs employers up to $16,500 per incident. These accidents include use of fleet vehicles and company trucks/cars. TIP: Develop a driving safety program to keep your employees safe on the road. Slip and Trips. This category does include falls. Examples of this injury is slipping on a wet surface without falling but still pulling a muscle. Good housekeeping procedures can help eliminate these injuries. Make sure work areas are clear of debris, extension cords, clutter, etc. Make sure any wet areas are clearly marked with wet floor signs. Caught in equipment. These injuries include your hand getting stuck in a machine, or employees getting pulled into some type of machinery. Make sure employees receive lockout tagout training annually. TIP: Make sure employees do not wear loose clothing. Struck against object or equipment. Examples of this injury involve workers running into pipes, corners, machinery or other people. TIP: Make sure workers do not carry things that can obstruct their view. Make sure they use extra caution when walking around corners. Repetitive motion involving micro tasks. These injuries are quite common in the manufacturing industry. TIP: Practice a rotating schedule so employees are not making the same movements over an extended period of time. Need Some Help With Deciding What Training Topics To Cover? Call SRP to Discuss Your Program Today! Call SRP at (866) 222-4972 or visit us online.